With a solemn ceremony, the treasury hall in Panagyrishte was opened, where the original of the celebrated Panagyurishte Gold Treasure will be displayed for one month. Vice President Margarita Popova, Deputy PM and Interior Minister Tsvetan Tsvetanov, Minister of Culture Vezhdi Rashidov, heirs of the treasure’s discoverers, historians, curators and public figures were present at the opening. 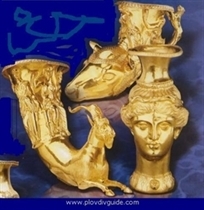 This country has inherited various cultures – Thracians, Greeks, Romans, Byzantians etc. have all lived here, and the more the world sees of us, the more it will become aware that we are a small nation of substance, the minister of culture said at the ceremony. He announced that the next stopover of the Thracian gold treasure that has been touring the world for years, will be the Czech Republic.